3. the central government decrees a strategy or investment, i.e. makes something happen (the Interstate Highway system in the 1950s, the space race to the moon in the 1960s, for example). I don’t think any of these templates really captures the eventual impact of cryptocurrencies and blockchains, which I define broadly as any decentralized, distributed ledger. As for the better mousetrap– the creators of bitcoin explicitly designed a form of money that they reckoned was superior to centrally controlled fiat currency. A decentralized form of money that isn’t borrowed into existence like fiat currencies is certainly revolutionary, but that is only one aspect of the crypto-blockchain technology. Since bitcoin and the blockchain technology behind it aren’t owned by a corporation, the template of a company benefiting from disrupting existing business models (for example, Apple’s iPod, iTunes and iPhone) doesn’t fit. It’s certainly true that cryptos and blockchain are spawning a new industry, much like micro-processors and digital memory launched the computer revolution and the world wide web and its protocols launched the Internet revolution. There are between 1,600 and 1,900 cryptocurrencies and tokens based on them, and hundreds of enterprises are developing applications for blockchain and related technologies. The difference between these old templates and the crypto-blockchain technologies is these have explicit social and political applications and ramifications–consequences that cannot be mapped onto consumer product innovation or process innovations such as increasing computational power. These technologies have the potential to re-order the structure and processes of governance and of social relations. In this way, crypto-blockchain technologies are leveraging the potential of computers and the web for direct political-social innovation. “The big idea with Politeia was to create a time-anchored filesystem with a minimal on-chain footprint, so you can be certain that the information in the filesystem existed on or before a particular date. Additionally, it includes identity data, so that person/entity X can attest to data Y at time Z in a way that cannot be altered after-the-fact. I felt that having a plain old website for our governance system wasn’t sufficiently censorship resistant. This sort of distributed ledger–stripped of the computational weight of the blockchain– could power community democracy, the distribution of a labor-backed currency (as I describe in my book A Radically Beneficial World) and render market transactions transparent to all participants. These applications don’t enrich a corporation–they re-order the power structure of the economy and society. I don’t think there are any historical templates that fully capture the potential for such a direct (i.e. not a byproduct or second-order effect) re-ordering of political and financial power. 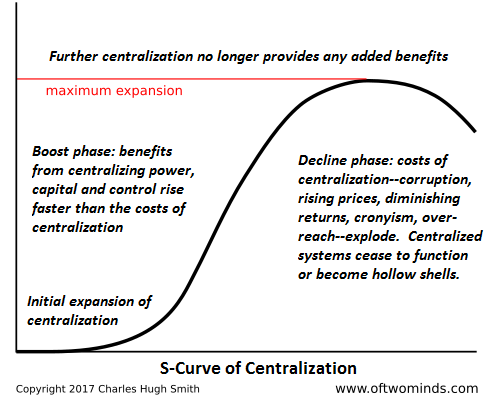 This article (Solutions without Historical Templates: Cryptocurrencies and Blockchains) was originally created and published by WashingtonsBlog and republished here with permission and attribution to author Charles Hugh Smith and WashingtonsBlog.